The first voice movie in India was release at the Majestic Cinema in Mumbai (then Bombay). Alam Ara was the first voice movie of India which was made under the banner of Imperial Movie tone. Alam Ara, which means ‘The Ornament of the World’, is basically an Urdu movie which also had some amount of Hindi in it. Once the movie was released, people of the country just ran to the theatre to watch the film, as this was the first time that any theatre has a talkie film. 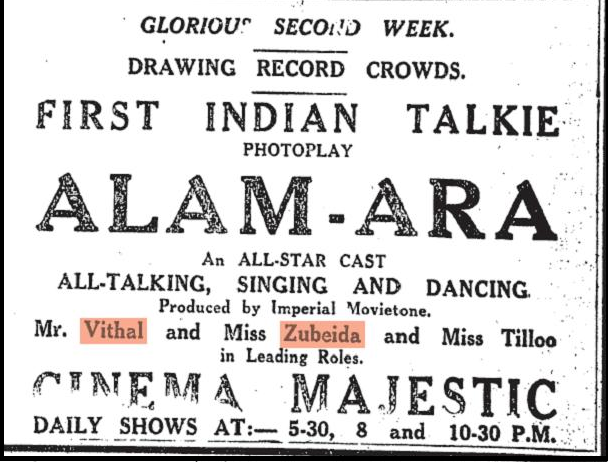 The first talkie film of India was adopted from a famous Parsi play called Alam Ara. The play was written by Joseph David. The film was basically a love story, where a prince of the kingdom of Kumarpur and a gypsy girl fall in love. The film revolves around the King who has two wives named Dilbahar and Naubahar. Everything is fine and peaceful until a stranger predicts that the Naubahar will have the King’s heir. Listening to this the other queen tries to have an affair with the chief minister of the Kingdom, but then the relation becomes bad eventually and the queen imprisons the minister and exiles his daughter. The daughter character is Alam Ara, she ultimately falls in love with the prince of Kumarpur. The movie ends with the minister being released from the prison and the bad queen being punished. This movie had some of the big names of that time as the star cast. The movie’s cast included actors like Zubeida (AlamAra), Master Vithal (the Prince), Prirhviraj Kapoor (Chief Minister of the King), Jilloo, L.V. Prasad, W.M. Khan and Sushila. The music of the movie was done by Ferozshah M. Mistri and B. Irani. Along with the movie the music of the film was also widely recognized and loved by people. First being the first sound movie, this film has made excellent use of music, dance and songs. The film was made in two month, and without any sound proof stages. The film was mostly shot indoors, during the night time. The film has not received any formal awards, but the film has surely received a lot of recognition. Just after the movie released, people rushed to the theatres to watch it. The music and the songs of the movie was loved. But sadly the print of the movie has been lost and is still not available, as said by the National Film Archive of India.